Our product range includes a wide range of hygienic plus pump, industrial effluent pumps, axial flow pump, fluid transfer system, molasses pump and stainless steel horizontal pumps. We are recognized as an affluent entity, engaged in suggesting a wide assortment of Hygienic Plus Pump that less outspread as well as axial advance and low rubbing velocity. These hygienic pumps are developed in accordance with the set industry norms & finest quality of components. Offered hygienic pumps are used to handle large proportions of gas and entrapped air and various properties of solids. Our quality experts examine these hygienic pumps on a number of parameters in order to make certain its flawlessness. We are the Leading manufactures of Axial Flow Pump. The pumps are designed to work with low to high lubricant fluids, low to high viscosity, shear sensitive and/or chemically agressive media. This pump operates with a drive screw intermeshing with a driven screw transferring torque from one to the other. The screws are surrounded by the pump housing made of ferrous material. The screw geometry and the housing form the pumping chamber. 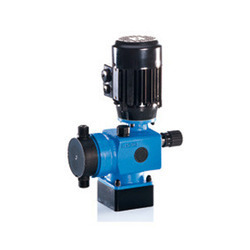 Rotation, screw diameter, and screw pitch define the pump‘s flow rate. The product lubricates the internals. Four special bushings keep the screws aligned. The axial force resulting from the pumping motion is practically nil due to the pump’s hydraulic balancing. The NETZSCH Two Screw Pumps have a drive screw intermeshing with a driven screw, transfering torque from one screw to the other. The main advantages are hydraulically balanced, quiet operation, long lifetime in service and flow without pulsation. NETZSCH Pumpsand Systems are the Leading manufacturer of Fluid Transfer Pumps. The Positive Displacement Pump principle is ideal for handling slurries, viscous, shear sensitive or two/tri phase mixtures or when applications require, significant suction lift capabilities. NETZSCH Pumpsand Systems are the Leading manufacturer of Molasses Pumps. The Positive Displacement Pump principle is ideal for handling slurries, viscous, shear sensitive or two/tri phase mixtures or when applications require, significant suction lift capabilities. NETZSCH Pumpsand Systems are the Leading manufacturer of Stainless Steel Horizontal Pumps. The Positive Displacement Pump principle is ideal for handling slurries, viscous, shear sensitive or two/tri phase mixtures or when applications require, significant suction lift capabilities. Banking on the skills of our professionals, we are offering a quality assured assortment of Stainless Steel Vertical Multistage Pumps. The Stainless Steel Vertical Multistage Pump is widely demanded for its sturdiness and quality. Besides, these products are available in the market at reasonable rates. NETZSCH Pumpsand Systems are the Leading manufacturer of Industrial Mud Pumps. The Positive Displacement Pump principle is ideal for handling slurries, viscous, shear sensitive or two/tri phase mixtures or when applications require, significant suction lift capabilities. 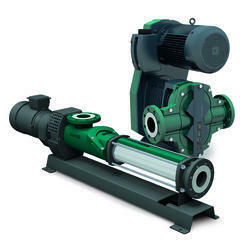 NETZSCH Pumps and Systems are the Leading manufacturer of Industrial Pumps. The Positive Displacement Pump principle is ideal for handling slurries, viscous, shear sensitive or two/tri phase mixtures or when applications require, significant suction lift capabilities. NETZSCH Pumpsand Systems are the Leading manufacturer of Coolant Pumps. The Positive Displacement Pump principle is ideal for handling slurries, viscous, shear sensitive or two/tri phase mixtures or when applications require, significant suction lift capabilities. We are the Leading manufactures of Soilds Handling Pumps. Advantages of the Soilds Handling Pumps. NETZSCH Pumpsand Systems are the Leading manufacturer of Industrial Process Pumps. The Positive Displacement Pump principle is ideal for handling slurries, viscous, shear sensitive or two/tri phase mixtures or when applications require, significant suction lift capabilities. NETZSCH Drum Pumps actually pump their way through your products reaching the bottom of the drum with less than 1% left in the container. The heart of the drum emptying unit is a NEMO® progressing cavity pump which creates positive displacement, low pulsation flow to convey your product without damage. In fact, most products are only exposed to the friction loss through the discharge piping. The NETZSCH single slide rail system raises and lowers the follower plate safely while providing a simple and easy structure to clean. NETZSCH Pumpsand Systems are the Leading manufacturer of Industrial Pumps. The Positive Displacement Pump principle is ideal for handling slurries, viscous, shear sensitive or two/tri phase mixtures or when applications require, significant suction lift capabilities. We are NETZSCH, we stand for quality Pump Component. With our products, we continuously set new standards. We combine state-of-the-art technology with the responsible use of all resources. Our customers can trust us as a reliable partner. Each order is handled without delay and in keeping with the promises we made. Consequently we care for an uninterrupted workflow through all processes and strive to improve them everyday. Mistakes by any of us are seen as a chance for further improvement. Individual responsibility is a crutial part of our company culture and only by working together as a team can we fulfill the quality standards we have set ourselves. NETZSCH service, quality and original parts ensure that the pump in your system operates reliably. Experience with more than 500,000 installed pumps is behind the reliability we can provide. Five production sites ensure parts can be supplied immediately to all corners of the world. NETZSCH Pumpsand Systems are the Leading manufacturer of Well Servicing Pumps. The Positive Displacement Pump principle is ideal for handling slurries, viscous, shear sensitive or two/tri phase mixtures or when applications require, significant suction lift capabilities. We are the Leading manufactures of Multiphase Pump. The robustness of progressing cavity pump technology along with its lack of sensitivity to the composition of the medium comes into play both in the mid and downstream area, especially where oils with high contents of other substances have to be transported. Conventional conveying systems quickly reach their limits when consistencies fluctuate, which leads to conveyance failures, pressure loss and material damage. For this reason, costly separators sometimes have to be constructed at every borehole in a field. The pump manufacturer has developed a multiphase pump precisely for this area of application. This deals with mixtures of oil, water and gas along with sand content and in doing so achieves conveyance rates of up to 600 m³/h. The tiny shear forces and low pulsation mean hardly any emulsion effects occur during transport, so that complex media can also be conveyed over long distances to collection points. There they can be separated in considerably fewer central separators, which reduces the infrastructure costs for the whole field. 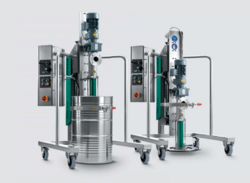 NETZSCH Pumpsand Systems are the Leading manufacturer of Stainless Steel Pumps. The Positive Displacement Pump principle is ideal for handling slurries, viscous, shear sensitive or two/tri phase mixtures or when applications require, significant suction lift capabilities. NETZSCH Pumpsand Systems are the Leading manufacturer of Skid mounted Pumps. The Positive Displacement Pump principle is ideal for handling slurries, viscous, shear sensitive or two/tri phase mixtures or when applications require, significant suction lift capabilities. NETZSCH Pumpsand Systems are the Leading manufacturer of Alum Rotary Lobe Pumps. The Positive Displacement Pump principle is ideal for handling slurries, viscous, shear sensitive or two/tri phase mixtures or when applications require, significant suction lift capabilities. We are the leading manufactures of Moyno and Rotary Lobe Pumps. These Pumps delivers reliable performance to the maximum duty requirements of your application in a compact package. Features include suction lift capability up to 28 feet, positive displacement for process control, and variable speed for accurate dosing. We are the Leading manufactures of Single Screw Pumps. Our Progressive Cavity pumps are of heavy duty construction and are designed to pump ‘tough – to – handle’ fluids with ease. These pumps are used in many areas of Industry. The construction of these pumps is based on the modular concepts and incorporate next generation pumping elements (molded to metal) stator, solid shaft and double sealed Cardan Universal Joints for improved performance and longer service life. These pumps are available in bare shaft and close coupled configuration. 6 and 8 stages in select sizes. A variety of material of construction, shaft sealing options are also available. 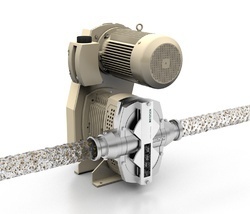 NETZSCH Pumpsand Systems are the Leading manufacturer of Metering and Dosing Pumps. The Positive Displacement Pump principle is ideal for handling slurries, viscous, shear sensitive or two/tri phase mixtures or when applications require, significant suction lift capabilities. From the first day of our inception, we retail and trade the finest quality of Air Operated Diaphragm Pumps. Owing to its ability to tolerate high temperature, compact design and enhanced pumping efficiency, the rendered air operated double diaphragm pumps highly demanded. For the purpose of meeting the specific needs of our clients, we render air operated double diaphragm pumps in various technical specifications. NETZSCH Pumpsand Systems are the Leading manufacturer of Inline Slef Priming Pumps. The Positive Displacement Pump principle is ideal for handling slurries, viscous, shear sensitive or two/tri phase mixtures or when applications require, significant suction lift capabilities. NETZSCH Pumpsand Systems are the Leading manufacturer of Aseptic Pumps. The Positive Displacement Pump principle is ideal for handling slurries, viscous, shear sensitive or two/tri phase mixtures or when applications require, significant suction lift capabilities. NETZSCH Pumpsand Systems are the manufacturers of NEMO Pumps. The Positive Displacement Pump principle is ideal for handling slurries, viscous, shear sensitive or two/tri phase mixtures or when applications require, significant suction lift capabilities. NETZSCH Pumpsand Systems are the Leading manufacturer of Rotary Lobe Pumps. The Positive Displacement Pump principle is ideal for handling slurries, viscous, shear sensitive or two/tri phase mixtures or when applications require, significant suction lift capabilities. NETZSCH Pumpsand Systems are the Leading manufacturer of Mohno Pump and Rotary Lobe Pumps. The Positive Displacement Pump principle is ideal for handling slurries, viscous, shear sensitive or two/tri phase mixtures or when applications require, significant suction lift capabilities. NETZSCH Pumpsand Systems are the Leading manufacturer of Filter Press Feed Pumps. The Positive Displacement Pump principle is ideal for handling slurries, viscous, shear sensitive or two/tri phase mixtures or when applications require, significant suction lift capabilities. NETZSCH Pumpsand Systems are the Leading manufacturer of Feed Pumps. The Positive Displacement Pump principle is ideal for handling slurries, viscous, shear sensitive or two/tri phase mixtures or when applications require, significant suction lift capabilities. NETZSCH Pumpsand Systems are the Leading manufacturer of Dry Pit Pumps. The Positive Displacement Pump principle is ideal for handling slurries, viscous, shear sensitive or two/tri phase mixtures or when applications require, significant suction lift capabilities. NETZSCH Pumpsand Systems are the Leading manufacturer of Effluent Transfer Pumps. The Positive Displacement Pump principle is ideal for handling slurries, viscous, shear sensitive or two/tri phase mixtures or when applications require, significant suction lift capabilities. NETZSCH Pumpsand Systems are the Leading manufacturer of Semi Submersible Pumps. The Positive Displacement Pump principle is ideal for handling slurries, viscous, shear sensitive or two/tri phase mixtures or when applications require, significant suction lift capabilities. 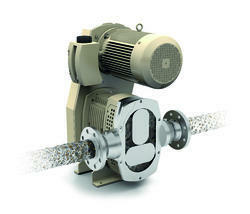 NETZSCH Pumpsand Systems are the Leading manufacturer of Closed Drain Pumps. The Positive Displacement Pump principle is ideal for handling slurries, viscous, shear sensitive or two/tri phase mixtures or when applications require, significant suction lift capabilities. NETZSCH Pumpsand Systems are the Leading manufacturer of Oil Transfer Pumps. The Positive Displacement Pump principle is ideal for handling slurries, viscous, shear sensitive or two/tri phase mixtures or when applications require, significant suction lift capabilities. 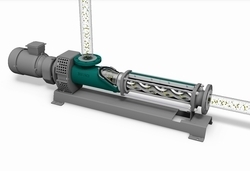 The Spray Dryer Feed Pumpis used in many branches of industry to provide continuous, pressure-stable, gentle and low-pulsation conveyance with dosing in proportion to rotation speed. It is employed primarily for highly viscous, compacted and crumbly substances that have a tendency to bridge. 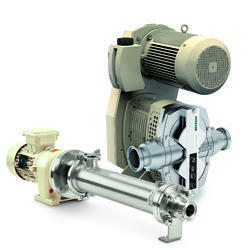 NETZSCH Pumpsand Systems are the Leading manufacturer of Viscose Feed Pumps. The Positive Displacement Pump principle is ideal for handling slurries, viscous, shear sensitive or two/tri phase mixtures or when applications require, significant suction lift capabilities. 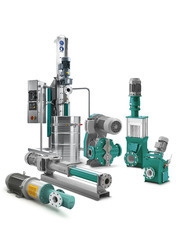 NETZSCH Pumpsand Systems are the Leading manufacturer of Mono Pumps. The Positive Displacement Pump principle is ideal for handling slurries, viscous, shear sensitive or two/tri phase mixtures or when applications require, significant suction lift capabilities. We are the Leading manufactures of Crude Oil Pumps. In the oil field, surface water mixed with crude oil accumulates in pits. These pits must be emptied. There can be considerable variation in the viscosity of this oil/water mixture, depending upon its temperature and the ratio of its components. 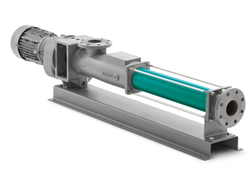 NETZSCH® Immersible Pumps convey this mixture reliably and securely to processing plants from depths of up to 15m.